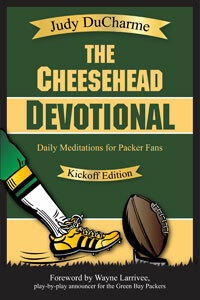 The Cheesehead Devotional was published in September. This book is most definitely designed for Green Bay Packer Fans all over the world. Taking game day events, player interviews, and historical Packer information, I have woven in the truth of God’s Word, the Bible, in presenting real life illustrations of God’s love and His hand at work in our lives. It will be available at Amazon and on eBooks as well as local bookstores. Sara White, Reggie’s wife, wrote the forward. Wayne Larrivee, radio voice of the Packers, and Bonita Favre, Brett’s mom, both endorsed the book. My love for the Packers goes back to 1983 when we were about to move to Door County, Wisconsin from the Detroit, Michigan area. I had grown up a Lion’s fan, but I quickly ‘converted’ to being a true Packer fan. We had season tickets through the glory years of Reggie White, Brett Favre, and Super Bowl XXXI. My love for Jesus and the Bible goes back even further, to my teenage years. He is my focus, my Lord, my reason for living. So this book was certainly fun for me. I hope it is fun, meaningful, and maybe even life-changing for you. Check it out on Amazon and local bookstores.